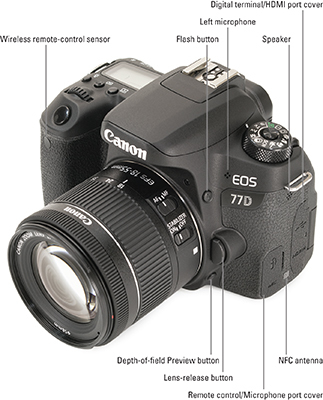 Your Canon EOS 77D has so many features that it can be difficult to remember what each control does. 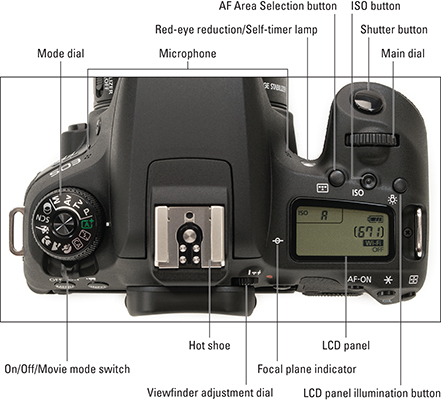 To help you sort things out, this Cheat Sheet offers a handy reference to your camera’s external controls and exposure modes. Print out this guide, tuck it in your camera bag, and get a head start on taking great photographs! 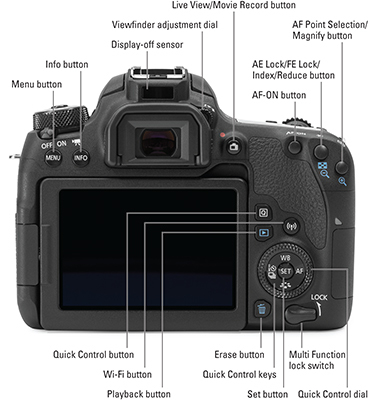 It’s great to have a map to the buttons and controls on your Canon EOS 77D camera, but it’s not a lot of help if you can’t remember which button to press when (and why). So here’s a quick recap of what you can do with each button. Note: This information concentrates on features available when you shoot in the P, Tv, Av, and M exposure modes. A few features also work in other modes. Mode dial Sets the exposure mode, which determines how much control you have over picture settings. For the most control, choose P, Tv, Av, or M.
Shutter button Press halfway to autofocus and meter; press fully to take a photo. Main dial Rotate to change settings. On/Off/Movie mode switch Turns the camera on in still photography or movie mode. AF Area Selection button Press to display the AF Area Selection setting, which controls which autofocus point or zones the camera uses to set focusing distance. ISO button Press to display a screen where you can adjust the ISO setting, which determines how sensitive the camera is to light. LCD panel illumination button Turns on LCD panel backlighting. LCD panel Displays camera setting information in an alternate form than the viewfinder or back LCD monitor. Menu button Press to display and hide camera menus; rotate Main dial to cycle through menu pages. Info button During playback, Live View photography, and Movie shooting, changes the data display. During viewfinder photography, toggles between the normal information display and an electronic level. Display-off sensor Automatically turns the back LCD monitor off when you look through the viewfinder. Live View/Movie record button Press to toggle Live View on and off. When the camera is in Movie mode, press to start and stop recording. AF-ON button Pressing this button initiates autofocus, just as if you were pressing the shutter button halfway. 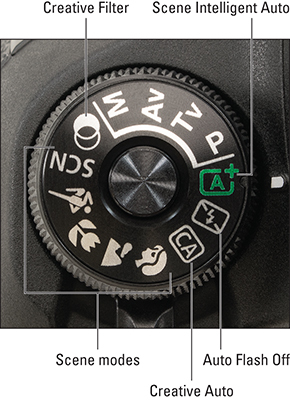 AE Lock/FE Lock/Index/Reduce button During shooting, press to lock autoexposure (AE) or to lock flash exposure (FE). During playback, press to cycle from single-image view to index (thumbnails) view. If the displayed image or live preview is magnified, press to reduce the magnification level. AF Point Selection/Magnify button During viewfinder photography, press to display the AF Area Selection screen. (You still must use the AF Area Selection button to change the setting.) In Playback mode, press to magnify the image on the monitor. In Live View or Movie mode, you also can magnify the display under certain circumstances. Q button Activates Quick Control mode, which provides fast access to shooting and playback settings. Press again to exit Quick Control mode. Wi-Fi button Press to display menu screen containing options for configuring wireless connections to a computer, smartphone, or tablet. After you’ve configured the Wi-Fi feature, pressing the button enables you to quickly connect and disconnect. Quick Control dial Use the Quick Control dial to quickly scroll through many different options and settings. It’s very handy and is a great timesaver. Set button/Quick Control keys During viewfinder shooting, press to access the following settings: top key, White Balance; right key, AF Operation; bottom key, Picture Style; left key, Drive mode. When choosing options from menus and other screens, use the Quick Control keys to highlight an option and then press Set to select that option. Erase button While reviewing pictures, press to erase currently displayed or selected photos. Multi Function lock switch Locks certain controls so that you don’t accidentally change camera settings when shooting. Flash button Press to raise built-in flash in P, Tv, Av, and M modes. When the flash is up, press again to access flash-related menu settings. Depth-of-field preview button Press to temporarily set the aperture to the selected f-stop so that you can see an approximation of depth of field in the viewfinder. Lens-release button Press to disengage the lens from the camera’s lens mount so that you can remove the lens.